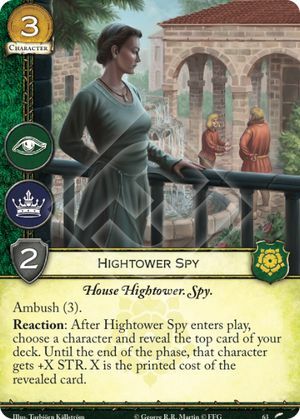 Reaction: After Hightower Spy enters play, choose a character and reveal the top card of your deck. Until the end of the phase, that character gets +X STR. X is the printed cost of the revealed card. Favor of the Old Gods #63. The character who will receive the strength boost is chosen before the top card of the deck is revealed.